I got a kick out of reading Dina's (aka elektrajewelry) profile in her Etsy store. In it she calls herself a "sparkle freak" - LOL! And her love for sparkle shows in the jewelry that she designs. Here is a beautiful necklace called Its Black and White. Isn't it just divine?! The polymer pendant is just to die for! And Dina did a great job wiring it all together in a fun and eclectic design. Do you like earrings? Well Dina has LOTS of those. Here is an absolutely gorgeous pair she calls Lady of Florence. The combination of wine colored glass and gold is rich and wonderful! All the pieces that Dina creates are one of a kind so you know you'll be getting a unique piece of jewelry art when you buy any of her designs. If you want to see all of Dina's creations be sure to visit her Etsy store Elektra Jewelry Design. If you want to know what new designs she's working on or what else she's up to then be sure to visit her blog. As I wander through Anna's shop I just ohhhh and ahhhh at the gorgeous beadwork designs she creates. I've tried it and just get REALLY tense trying to beadweave anything! LOL! 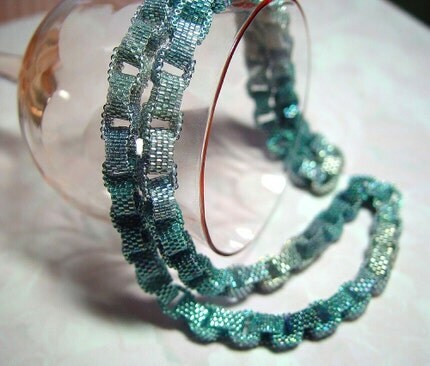 However - I really want to be able to weave a tube for bracelets so I'm going to take a class and see if someone can teach me more so perhaps I can find it relaxing to bead. I have doubts about it since I've cross-stitched for years and never got relaxed doing it. OK - back to Anna's Etsy store, arosebyname ... As I said, she makes stunning designs with beads and here is a gorgeous bracelet in a wonderful, emerald green with gold accents - Golden Verdigris. Isn't it beautiful! Here's another beauty - Linked to the Sea. I can't even imagine the number of hours it took to hand bead each link and there are 7,040 beads in this necklace! Truly a labor of love and a steal at twice the price! I can guarantee I'll never have the patience for this level of beading. Anna my hat is off to you! Want to see more? Then quick, click and visit Anna's Etsy store arosebyname! Want to know more about what Anna is up to? Then be sure to check out her blog. According to Karen of soandsewcrafty "sewing is my passion!" Not only is it her passion, but it is also her art. She has been sewing for 30 years and clearly enjoys her craft and has a wonderful eye for color. 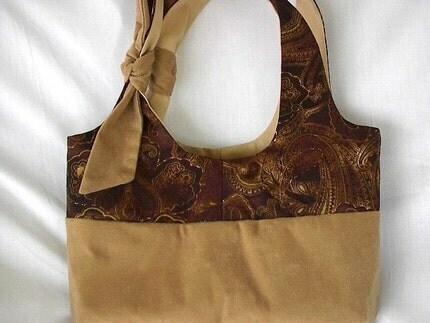 Just check out this wonderful Chocolate Paisley bag. Karen calls it "yummy" in the description and I have to agree! I just love the fabrics she used! 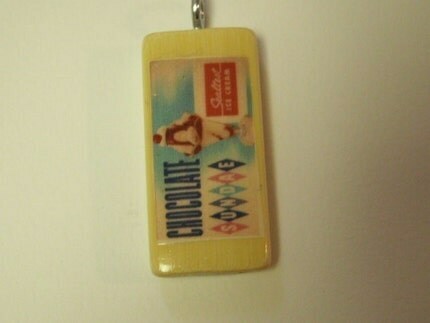 Of course I love chocolate so I'm sure I know have some psychological draw to the color that IS chocolate - LOL! Karen has many sewn items in her shop including stuffed dogs (they're soooooo cute! ), more bags, quilted throws, and clothes for adults and kids but, since we are getting close to Easter, I have to show you Bertha. Isn't she just lovely! 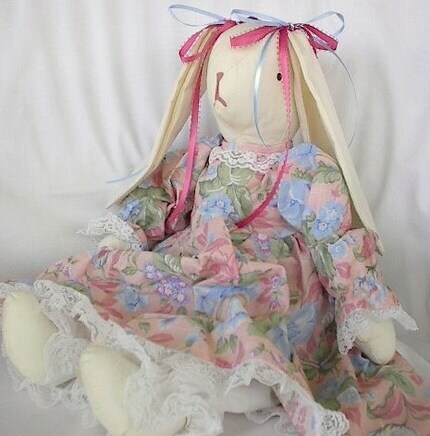 She would be a perfect filler for your favorite little girls Easter basket! So, are you ready to go visit Karen's soandsewcrafty Etsy store and see what other wonderful designs you can find? Then go! Shop! Enjoy! And, if you want to know more about Karen's life, family and art be sure to check out her blog. I finished my part of the charity collaboration! I showed the beads that Jan (afibrejourney on Etsy) made for me to design with and here's the design I created with the pretties! I also took a picture of the beautiful fused glass pendant that Jan sent "just because". Isn't it beautiful! She got some tools so she can put holes through her fused glass and once she learns to use them I'm hoping she can make some fused glass "beads" I can use for bracelets. She creates such wonderful color combinations! 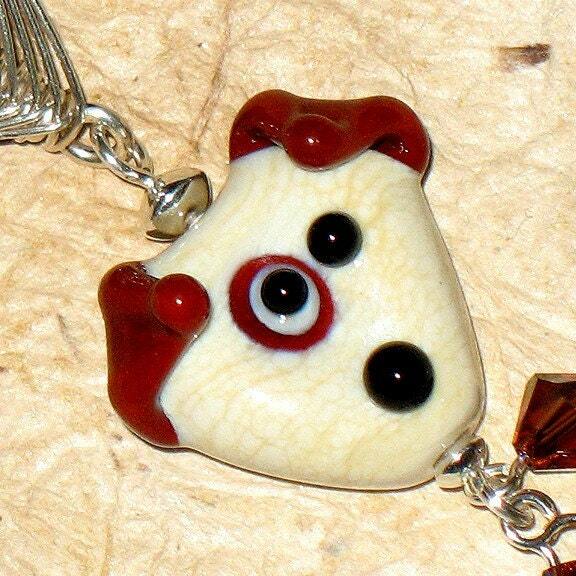 I found ALL sorts of fun and awesome jewelry designs in Ginny's ThatsHeadley Etsy store! It was a challenge to whittle the list down to just a couple of favorites but I managed - LOL! 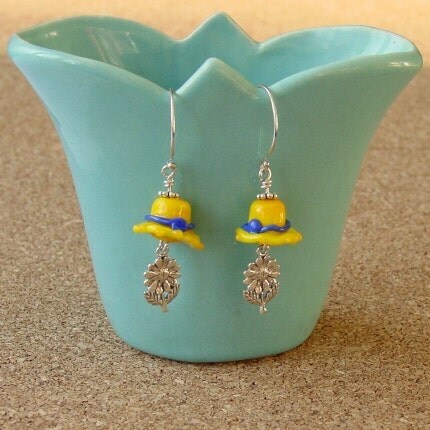 Here is a pair of "In the Garden" earrings that I just adore! Of course I'm a gardener and these are a natural design for a gardener to love. 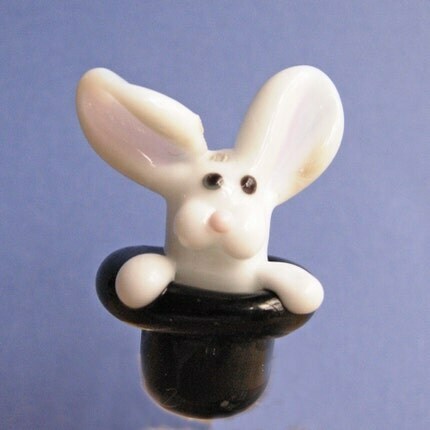 This is a wonderful combination of artisan lampwork hats and sterling silver charms. My hubbie says I always pick the most expensive items in a shop and I'll have to tell him that this time I didn't! The pendant focal is what I really liked about Gaia. 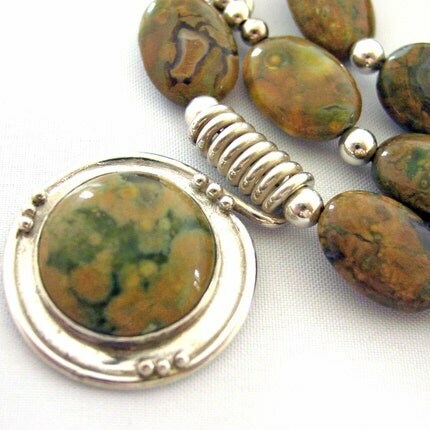 It is a wonderful, one of a kind, handforged sterling setting for a wonderful rhyolite cabachon. I love the way the wire comes out and then forms a spiral around the necklace. Isn't it gorgeous?! 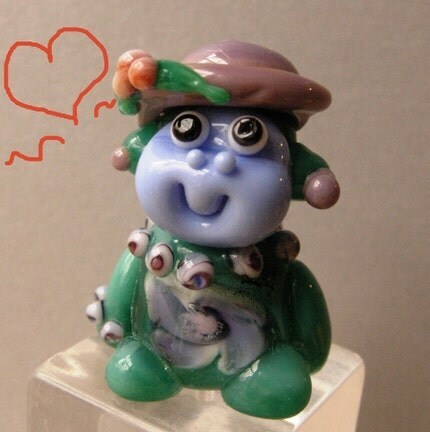 If you want to see more lovelies then be sure to visit ThatsHeadley on Etsy. Want to know more about upcoming new creations? Then be sure to check out her blog too! 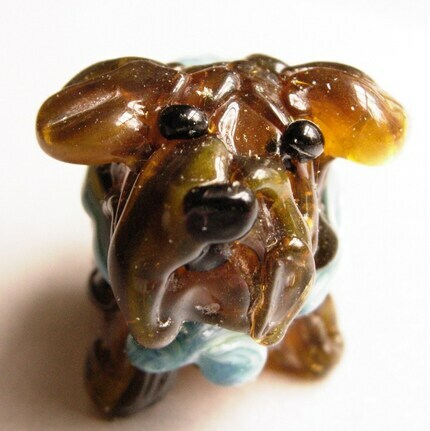 I'm a member of the etsyBEAD street team and we've teamed up with the Creative Glass Guild of Etsy (CGGE) street team to create designs that will be sold by the Helping Others Street Team (HOST). I was teamed up with Janet Thompson (afiberjourney is her name/store on Etsy) and received these pretty lampwork beads from her last week. She showed me LOTS of beads - she does both fused glass and lampwork so there were lots to choose from - I picked some of my favorites from the choices and she picked the final set to send out. Aren't they beautiful! Oh - she sent me a gorgeous fused glass pendant too! That was so nice and once I get a picture taken I'll share that too! Today I'm going to start designing with these beads to see what I come up with. Once I finish the design I'll post it for everyone to see and will ship it off to the HOST team so they can sell it in their store. If you want to know more keep an eye on the charity blog. You can see pictures of all the beads and designs too. I love the intro to her store "Foxy Modish Art & Jewelry for Swanky Fashionistas and Stylish Chaps!" My idea of mod seems to differ from hers - but it's art and only the artist can define what it is to her. 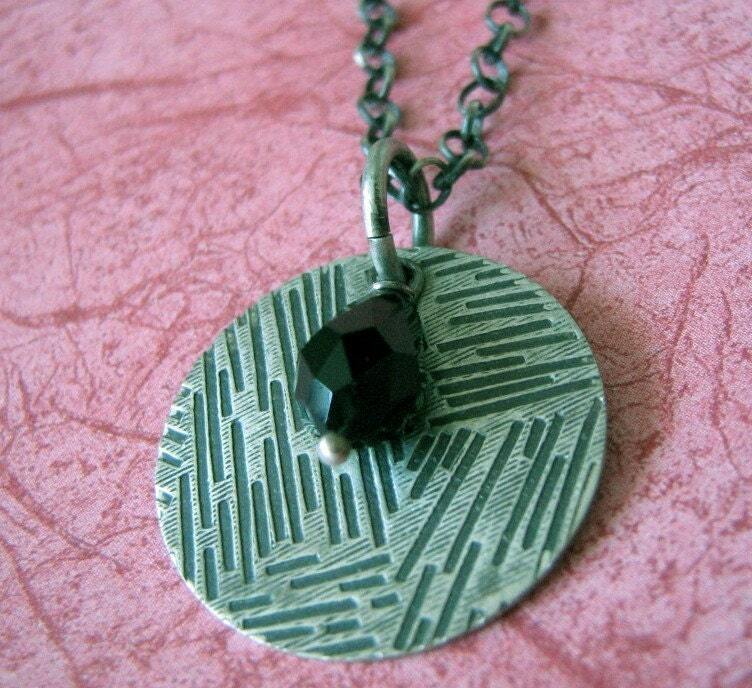 Most of her pendants are on bamboo and she also creates mixed media art. I just love her mixed media piece Moonlight! 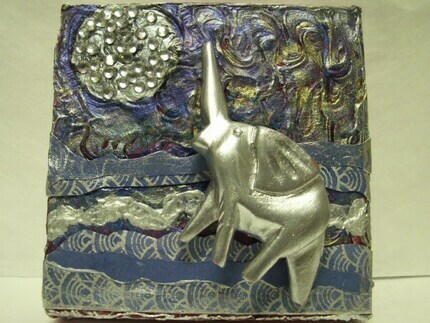 I like elephants and love the mix of colors and metallics that she created. It took me a while to find a pendant I liked (OK so maybe I'm not a modish fashionista - I yam who I yam!) but here's one that should strike a chord with many, including my hubbie, Chocolate Sundae! Be sure to see all her other pendants and art in her Etsy store. And if you want to hear more about her ideas and find out what she's up to be sure to check out her blog! Interested in jewelry or crocheted baby things? If so then be sure to check out SparklyStrandz Etsy store. You can find everything from nursing necklaces to interchangeable earrings to baby clothes and catnip toys! That's quite a variety. After browsing through the Sparkly Strandz Etsy shop I picked a few favorites. I love the combination of blue and brown (and it's supposed to be an in color combo this season) so this Smoke and Sapphire bracelet grabbed my attention. 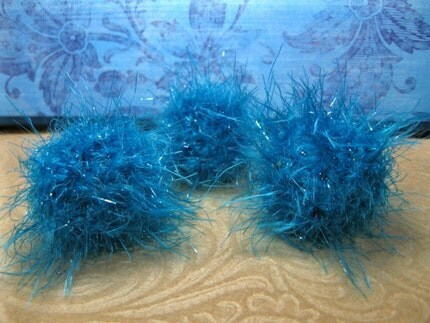 I'm a dog person, but I thought the kitty catnip toys were just too "tribble-like" to ignore. I also love the bright colors in them. Aren't they fun looking! If you want to see more of the lovely things for sale be sure to visit SparklyStrandz on Etsy! If you want to know more about the day to day happenings be sure to check out her blog. Finally - I've reached my first Etsy Blogger target - 1/3 of the way through my 90 features! I'm not quite doing 1 a day, but I'm making progress. 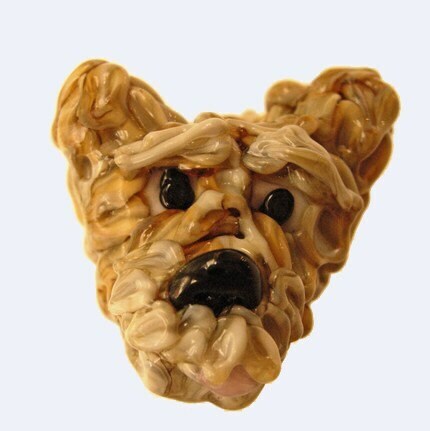 Today I'm featuring ALilsumptinsumptin aka Eva and she has DOG designs! She also lives in my part of the country - SoCal. How cool is that! You KNOW I can't resist dog designs - I love dogs! She's got some gorgeous designs with wonderful lampwork focals and in many cases 100% of the purchase price goes to an animal related charity! Here's a wonderful dog choker necklace with such a cute face and I love those floppy ears! 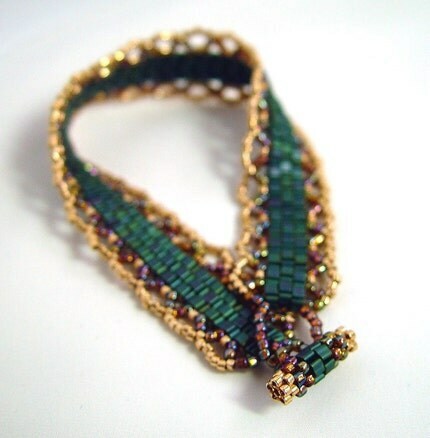 Check out the listing for this choker to see the gorgeous wirewrapping on the pendant. Here is a gorgeous necklace with no paw in sight - LOL! 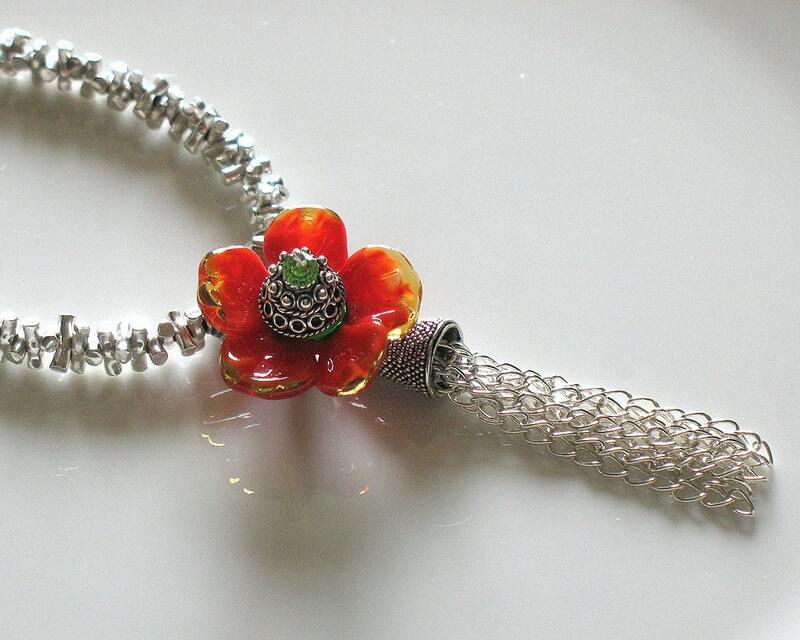 The dangling sterling silver chain makes a great tassle which, combined with the chain will point all eyes to the gorgeous lampwork flower.Want to more of Eva's wonderful designs? Be sure to check out her Etsy store. Want to more about what she's up to? Be sure to read her blog! Oh - what's the first thing I see in Dawn Brandt's store??? Chainmaille designs!! I love it, I've done it (made a pair of earrings), I'm impressed by folks who can REALLY do it since it looks so cool! My hands get sweaty and flustered when I do it - so it's not my favorite thing! 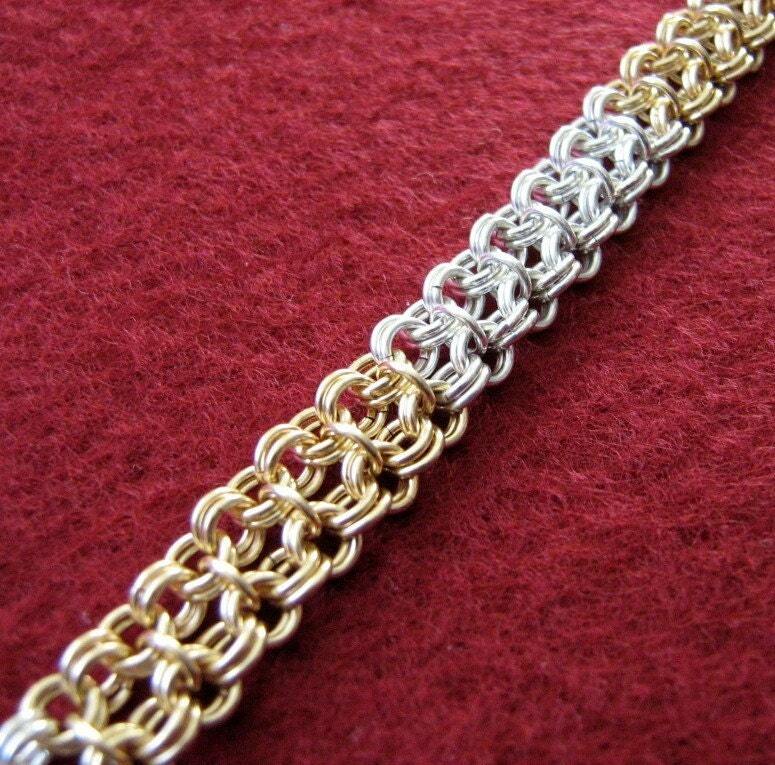 The first piece to draw my eye is this gorgeous chainmaille bracelet in sterling and gold filled - absolutely elegant! I'm starting to get into more metal work myself in my designs (it is just SO fun to hammer and pound on things - LOL!) so my next favorite in her shop is her In the Shadows necklace. I love the texture! She emphasized it beautifully by oxidizing the sterling and of course having a Swarovski crystal hanging there will add a nice bit of flash and glitter! Want to see more? Then be sure to check out her Etsy shop. Want to know more? Then be sure to check out her blog! Yes I had a blast in Tucson at the Gem and Mineral show. 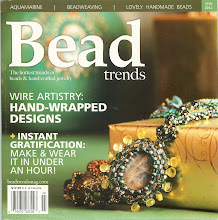 I also had a blast in Pasadena at the Bead and Design show. Of course for me having a blast definitely involves buying new THINGS for my creations. 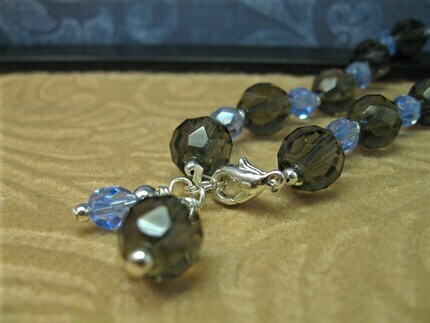 Here's the first creation using some of these new THINGS: smokey quartz from Tucson, gorgeous vermeille connectors from Pasadena and lampwork from Moosetrail Beads! Enjoy! I don't know much about the nitty-gritty of creating photographic prints - but Tiffany does. She got started in photography at the age of 7 and later in life got a BA degree in Art and Photography. 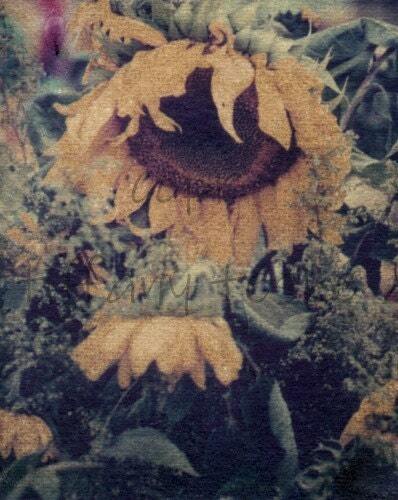 If you visit her Etsy shop you'll see some wonderful and original photography and you'll learn about the process she uses to transfer the images to something other than paper. 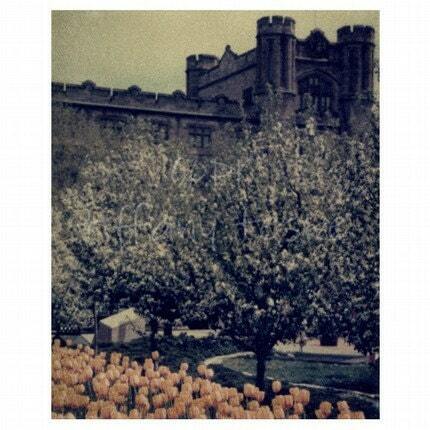 The concept is pretty cool in that it creates one-of-a-kind images from pictures since the transfer process is manual. The look is quite wonderful and is very different from a print. Tiffany's store is full of wonderful photos. Since I do like flowers (my garden is starting to get lots of spring bloomers!) I really enjoyed Radiant Warmth with it's wonderful sunflowers. I was also drawn to Effloresce II since I just came back from Paris and the castle in this picture brings back fond memories of all the castles and beautiful gardens I've visited in the Loire Valley in France. If you want to see a lot of castles in a short time - go there! Want to more about Tiffany and her art and life? If you do then be sure to visit her blog. OK - I admit it - I'm a lampwork hoarder! So, when I run into someone who makes wonderful beads I have to first spend time ohhing and ahhing over everything in their store. So, take a coffee break, ... watch the dust bunnies gather ... watch the rain fall or snow blow or sun shine (depending on your weather) ... have another cup of coffee ... OK - I've admired all the fun things in Marcy's store and now I'll share them with you... 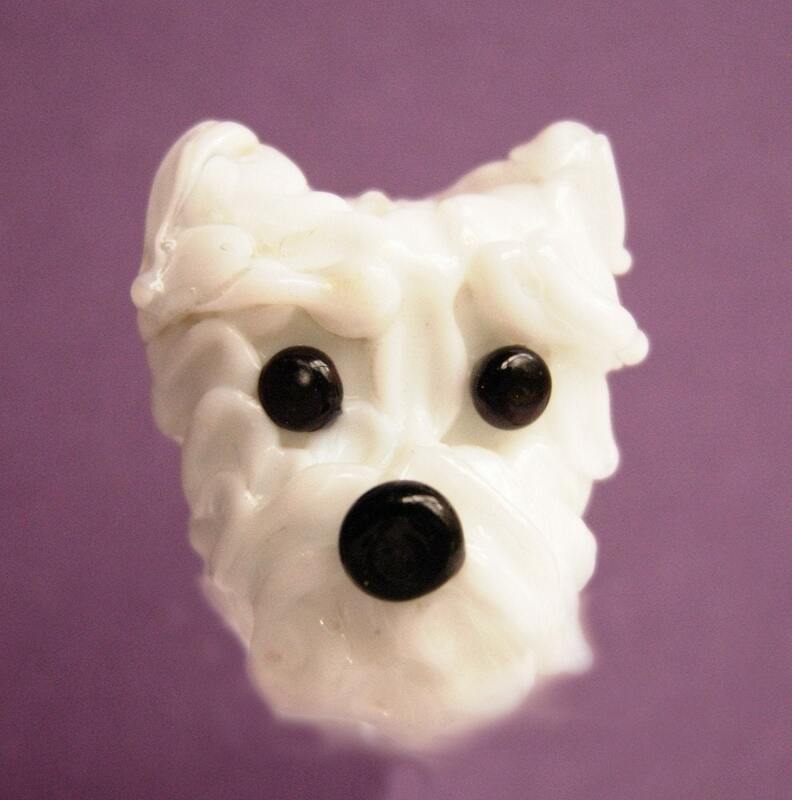 I just have to start by sharing all my favorite dog beads in her shop. Hey - I'm a dog person. Here are Fritzi (a Westie - and if you've read my blog you know Kirby the Westie is part of my pack! ), Freddie (he's a pound puppy and so is my Oscar), and Max! 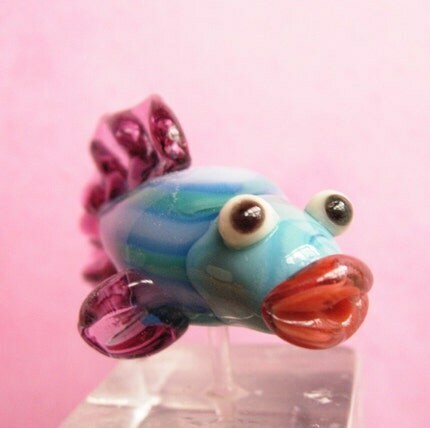 OK - now that I've shared some cute beads of MY favorite animal (yes Marcy does make cat beads, but you'll have to visit her Etsy store yourself to see them) I'll show you some other fun critters she created in glass. All her critters are adorable so be sure to check out her Etsy store. And, if you want to know more about what she has planned for glass or more about what she's up to in her life then check out her blog!